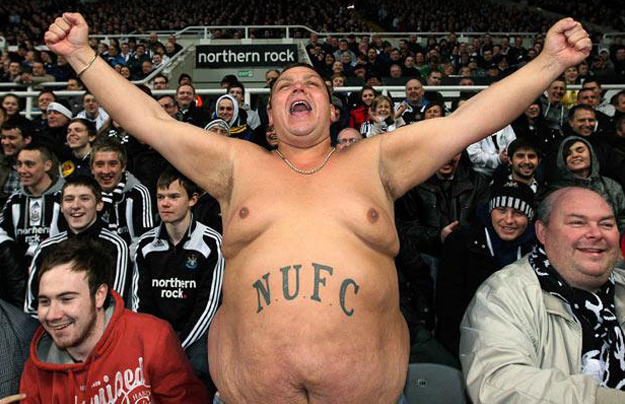 Newcastle away …. any answers … or more questions? We got 3 points away from home at a ground that I am not sure will be that easy for many of our rivals this season. On the general positive front our passing and movement was excellent and only lacked that last little itty weeny bit….the placement of the ball between the white thingy’s with the mesh behind it. Ok we did place it there once but at the end you did feel we should have been far more comfortable. Also, yes, we should have had a penalty, so the officials once again conspire to undermine our season. We should be 2 points and 2 goals better off right now. I mention the officials because the toon fans obviously felt very hard done by yesterday. However in the cold light of day and viewing these incidents again I would challenge any of them to disagree with the decisions. If anything the non penalty penalty kept them in it. With that as well as the other goal I think we would have gone on to score 2 more. So with general all round excellent play why didn’t we put them to the sword a bit more? Does this have implications for the season? Are we lacking a world class cutting edge up front or could it be more simply that we are not quite in full gear yet? Could it also be that McClaren has them far more organised now and that Newcastle didn’t come out to play enough football and got so many men behind the ball that breaking them down was always going to be tough. If anything it possibly got tougher once they were a back’s to the walls 10 man outfit. My stance has softened on yesterday once I stepped back and reviewed it. I actually think we looked so fluid and sharp that we forced them into a bus parking exercise. Someone may come before the transfer window closes, to provide that extra cutting edge up front, but let’s say they don’t, and there is a very real chance of that. I still feel we have quite a bit at our disposal. Many are now looking to Welbeck to save us, because to many Giroud and Walcott can’t cut it, and I am looking forward to him getting his opportunity. However, even having been a critic of Giroud I still feel that both he and Walcott have something to offer as number 9’s, if we play them in the right way. I would also say that where Walcott is concerned he could be a number 9 option and still play as a wide player when needed. Many will use yesterday as hard “EVIDENCE” that Walcott can’t do it. Well as already said Newcastle firstly made it difficult. Secondly from my point of view none of Walcott’s chances were gimmes yesterday. If you watch them again in most of the cases Walcott is actually latching on to balls at high speed. That automatically makes it more difficult to control any shot on target than at a slower pace. It is of course easier if the ball is on the ground as you run onto it. He had a one on one with Krul in this situation and there is an argument that Theo could have done a bit better by chipping the keeper. Fair enough but not an easy skill at that pace and in reality it was Krul that did very well here in reading the game and coming out. His second big chance is the one that many are referring to as almost an open goal. The one on the rebound from Sanchez shot. Look at it again peoples. Again Theo is arriving at high speed…more difficult. Secondly the ball is bouncing….adds extra difficulty. Thirdly he is not directly in front of an open goal, but is at an angle with the keeper getting up from the ground to narrow his options….again adds to the difficulty. This was no gimme. Alright it didn’t happen for him or Ollie when he came on but the great Ronaldo and the great Aguero missed easier chances yesterday!!! This is not a “defence of Theo” post. More I am trying to rationalise why we didn’t quite make it easier and why our striking department individually and as a whole didn’t quite pull it off as well as they could have. Theo and Ollie might not be quite good enough to push us to the title. Then again they might be and my point is that yesterday is not enough for me personally to say they can’t. If anything I really wanted Wenger to play Theo to Giroud’s right when Ollie came on. With Ollie and no Theo teams play a higher line. With Theo and no Ollie teams play a deeper line. With Theo and Ollie they are in trouble either way. It looked a potent combination a couple of seasons back and would have meant that we had our next 3 most clinical goal-scorers (Sanchez, Rambo and Theo) all playing off Giroud. As said I don’t see any reason why they can’t rotate as striker or also play together. Arsene got his subs right because we won the game. Fair point. I do however feel the subs were a bit negative and he could have put them to the sword with something more similar to what I mentioned above. AOC could have gone in to the heart of midfield where all those pesky Newcastle players on yellows would have been shedding a load when he started to run through the centre at pace. We have in recent times been too gung-ho, but weirdly I also feel Arsene goes with too much caution and still needs to find that balance at times. 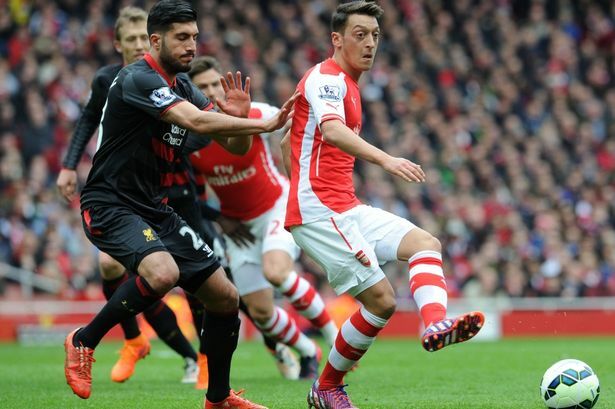 Ozil to win it for Arsenal? Newcastle. What do you think of when hearing that name? And in recent years a total road wreck of a football club. Managers sacked, dreadful players bought and sold, fan unrest, an owner who is hated by the fans and a top quality, traditional institution which could attract the very best becoming a selling club. Newcastle have spent 5 times as much money as AFC in this window (so far)! IMO this is a dreadful state of affairs and questions must be asked. I do not accept that players are not available – if they chose other clubs one must question the negotiating skills of our buying team. It is claimed that Thauvin chose Newcastle having been approached by AFC, if this is true our boys really do a crap job. McClaren is a good manager and will bring discipline into a difficult club who were lucky to escape relegation, he has bought young, pacy players who he hopes can change the atmosphere in both the changing room and the stands. Their start is worse than ours which brings some degree of hope. But we need points and we need them NOW. The usual …… hard work, team play, concentration, fast attacks, clinical finishing. A little bit of intricate passing and a sprinkling of magic. Could Chambers play worse than his first half on Monday? It would be difficult. There is a fair chance he will start alongside Paul Easter and if he does then AW has to instruct his midfield to give better protection. Dare AW drop Cazorla and play the Ox thereby adding some pace and width down the right? Or Ramsey? Or both and play Theo and Ox. I don’t know and I am not paid millions to make such a decision. What I do know is that at present things are not as they should be. There is imbalance in the team both vertically and laterally. We need more cohesion in front of goal, better understanding between the defence and the midfield, and less reliance upon left-sided attack. It has to be said (and it was by LB!) that if you have Ozil and Sanchez on the left then we are likely to use them. I really fancy Ozil to score today and will bet a fish that he will. The season start has shown that we have no idea how the team will perform today – who knows today could be the launch pad for a run of wins or it could signify the start of a difficult season. I will be watching from behind the sofa. Are Arsenal’s fullbacks good enough? The general perceived feeling on the forum is that we are doing fine on the full-back position as we have four reliable full-backs at our disposal:-Debuchy, Bellerin, Monreal and Gibbs. So Petr Cech has showed us we have have a world class keeper now. Happy with that. Again the footballing gods have betrayed us……a proper goal incorrectly ruled offside and Mignolet pulling out a couple of blinders (the only problem is so did Cech so that probably cancels itself out). Well by my reckoning we should be at least 7 points from 9 after 3 games, and I say at least. So we sit on 4. It is easy to say that this is not so much a problem so early in the season with so many games left, but the EPL is so competitive these days that a top team like us, (capable of winning the EPL), could probably lose it in the first 5 games if they leave themselves too much to do. I believe playing catch up is now far harder to do and you will not see the likes of our overhaul of Utd in the 1997-1998 season again. I believe playing catch up is now far harder to do and you will not see the likes of our In the last 2 seasons we have either finished as the winners in the first half or second half of the season but have not put 2 great halves of the season together and won the title. Consistency I guess is the order of the day. We could probably argue that injuries have played a large part historically, and I couldn’t disagree with that. Not quite having those extra 1-2 quality players in the right positions could also be an argument. I couldn’t disagree with that also. However, despite all this, and my personal feeling we still require 1-2 key top players to be an absolute certainty as a top team, we still have a squad with the potential to beat any team out there and win the top prizes. So it is my assertion that we are not making the most of what we have available to us. Boring I know to mention it again, but I still feel Arsene has a blind spot when it comes to favouring playing the types of players that he likes most as opposed to playing the best balanced side. Don’t get me wrong, Liverpool are not a bad outfit, but are a side in transition with a lot of new players and are not ready for a serious title charge. We did play parts of the game in the ascendency with some good spells but the sheer quality of the players on the pitch tends to guarantee that at times. One of the serious title challenging teams will expose Liverpool this season and the fact that we didn’t do this, and also win the game, potentially doesn’t bode well. A draw with Liverpool need not be a source of concern under normal circumstances, but for me there were possible worrying signs that we haven’t learnt from the past and that would be a shame for a team that I feel could win the EPL with what it currently has. Aside from the injuries this reminds me of the start of last season when we had a great team on paper but looked out of sorts. Arsene needs to sort it out quickly or we may end up the EPL champions for the 2nd half of the season again, and unless I am wrong they don’t give you a trophy for that. Loopy Lovren to do a Kolo? Plus this is a big test against a team who have spent almost €200m in two seasons! Selling your best players doesn’t help but Rodgers has to prove his success of two seasons ago was not purely a result of having a brilliant striker in the form of his life. AW has been there; selling your best players inevitably has an effect, fortunately the past two seasons has seen us keep our players and add to the quality of the squad – who knows who will be arriving at AFC over the next 7 days! So …. Liverpool. Never liked them. Hate the awful dirge of YNWA. I think I would even go so far as to say it is worse than Yellow Submarine! Just think of the dorks who have worn their shirt…. Keegan, Owen, P.Thompson, Dalgleish, One Minute, Emlyn Hughes, Suarez – the list is endless … but they are a very good team when in full flow, always have been. The question is, has Rodgers put together a winning team? The lack of a quality finisher (in the absence of Sturridge) hurt L’pool last season and the signing of the excellent Benteke gives them considerable attacking strength. Add in the wily Firmino and the excellent Coutinho and we can see why L’pool are confident of an improvement on last season’s disappointments. We smacked them last season when Kolo repaid AW for bringing him to Highbury – I doubt dirty Skrtel or Loopy Lovren will do the same. As to us, we have to improve. WHU – terrible, CP good for 45 mins, tonight – who knows? And that is what concerns me; we have the potential to be brilliant and very successful because this is the best squad for a very long time but as yet we continue to be unpredictable. Consistency is what wins titles and can you honestly say you are sure we will play well tonight? Thankfully we have an almost fully-fit squad (apart from Abou Wilshire and Abou Rosicky). Mr Wenger “just” has to pick his best team. Not easy – my guess is that if we all put in our best 11 that there would be many different 11’s. Theo or Ox? Theo or OG? Ramsey on the flanks? Cazorla alongside Le Coq? Monreal or Gibbs? Czech or Ospina etc etc. It is being suggested that pace will win this game for Arsenal thanks to L’pool’s static central defence – I agreee and would certainly start with Theo alongside OG in the middle. The problem with this is that it results in the Ox having to ride the pine. The Ox is one my favourite players and he needs to know he has the confidence of AW to be a central cog in this team – he is too good to be a bit-time player. It should be a good game between two attack-minded teams with Arsenal edging it. 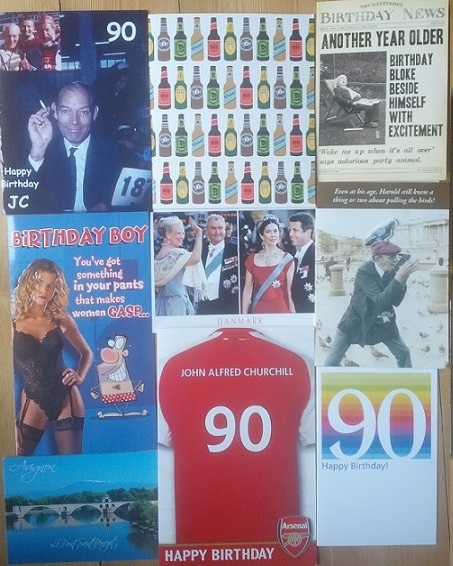 A massive ‘Thank You’ to everyone who sent (or tried to send) a card in response to my earlier post about the impending 90th Birthday of a certain John Alfred Churchill esq. Mr Churchill loved receiving the cards and I sent him a copy of the original post with all of your kind comments attached. GIE’s comment was my favourite, “JC is a legend – I’ve missed being asked when it’s due”. A certain pie salesman from Cornwall’s card was regarded by JC as an ‘Official’ one and much appreciated. The Danish royalty card written in best tour-guide Danish prompted JC to say, ‘I’ve even had one in a foreign language’. 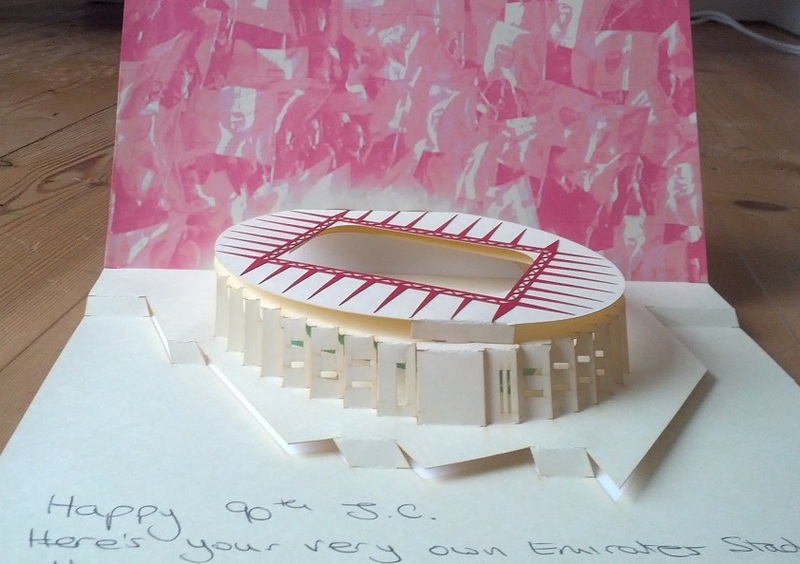 Rasp even managed to find a pop-up Emirates Stadium. Peaches’ card was perfect for an old boy who still has an interest in pulling the birds! “I’ve still got all the equipment, but I’ve lost the instruction manual”. GN5 wrote a paragraph about growing up near Highbury and being an Islington boy which was much appreciated by JC as another local lad. 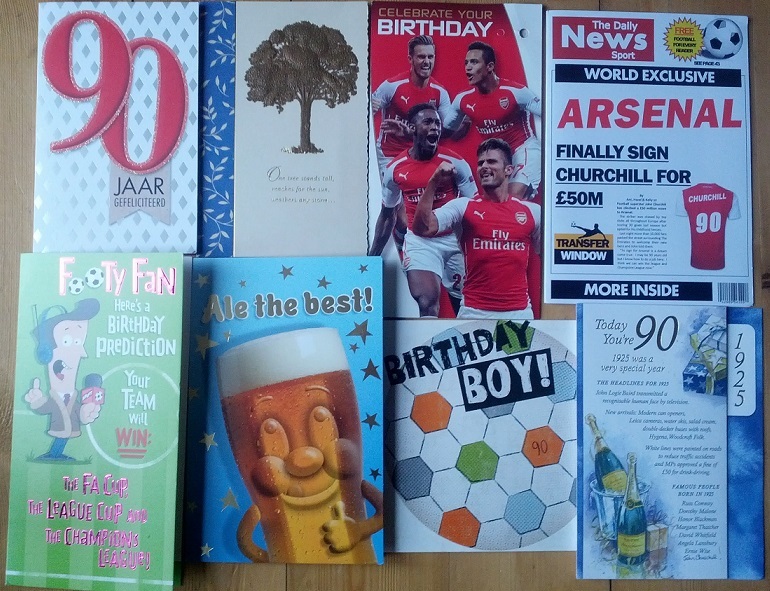 Joney’s card (bottom right in the above photo) was based on 1925, JC’s year of birth. It includes some 1925 information…. New Arrivals – double decker buses with roofs, water skis, salad cream and Woodcraft Folk (?). In the ‘Keeping You Entertained ‘ section – Top songs – Show me the way to go home, Yes Sir, she’s my baby and Dinah (as in ‘a yard above the knee’?). Shopping Costs – New Morris Oxford £275, Bottle of Scotch 63p and 4 bed Detached house £1400. 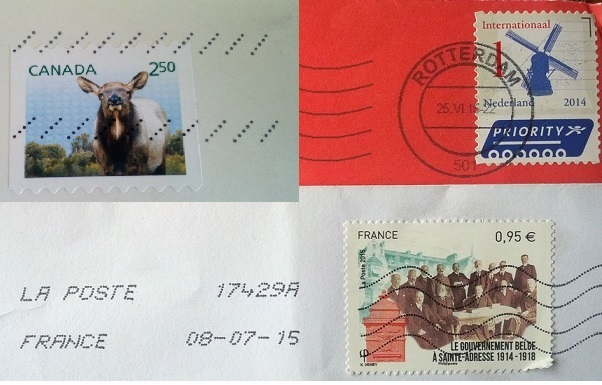 A few of my favourite postmarks and stamps. Thank you all again. 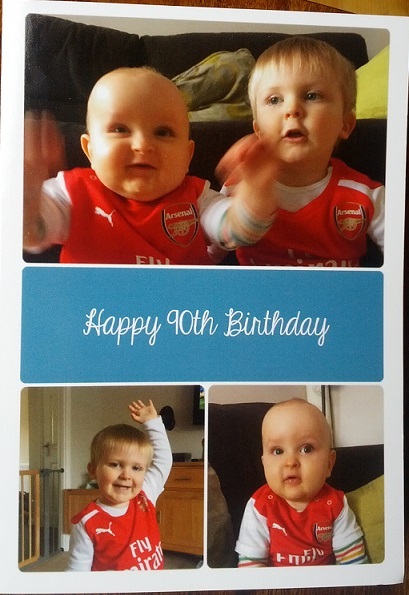 Your efforts in response to my request really made the old boy’s birthday a little different and special. Ta. How fair is the gift of the Olympic stadium? Rant Friday has brought many excellent rants, hopefully this one will compare. Topical subjects seem to grab the headlines, and at the moment West Ham are drawing attention. Clubs are up in arms, asking is it right that West Ham United are now going to stage their games at the Olympic stadium. There was a bit of a race before West Ham got the go ahead, a few clubs had put their names down to be considered, but it now seems clear that West Ham has won the day. 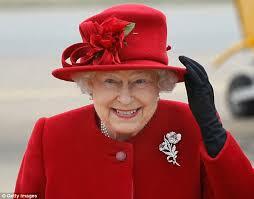 Of course the Olympic Stadium was built by tax payers money after we had won the bid to stage the Olympics in London. Plans were drawn up as to where the events would take place, luckily the infrastructure was already in place and even a few existing venues could be brought into use. Many like myself were not so delighted that we won the bid, as I knew that money would be no object to build structures that would probably only be used a few times, when London and Britain are crying out for tax payers money to be spent on more important things like health service schools even prisons, but where politicians tell us that funds are low to inject vast amounts of money into services that are used daily, but overnight funds were available to build projects like those to be used as Olympic stadia. Promises from the government that british builders would be inundated with building jobs were diminished seconds after it was stated as a foreign building firm got the contract, and as I passed the site on my way to work I saw the fleets of buses that ferried in the workers. As we know the stadia were built and the event went off smoothly. London Olympics was supposedly a big success, while the organisers patted themselves on the back, the British public was asking just how much and how have we benefited by this vast outlay. Of course after the event many of the structures put in place became redundant, many closed down while others were utilised to help in some way or other, but the Olympic Stadium where the bulk of the money was spent was looking a little like a ‘White Elephant’. I can remember years ago where another stadium was built in Manchester from tax payers money at huge expense and it looked like it would also be unused only to become the home of Manchester City. They took over the stadium and pay to rent it. I don’t know how much it would have cost to build but they have continued to invest in it by building another tier. I think that now is the time for my Friday Rant. Arsenal moved from old Highbury to a new site, The Emirates stadium. Arsenal needed bigger premises and with very little help available to fund the new build they chose to fund it themselves using the development of Highbury and to borrow money from the banks. You all know what happened in the next ten years, frugal spending, top players sold and a mortgage that was going to choke us for years and years. Britain’s government didn’t built our stadium, they never even found a little Olympic money to help us, but now its built and what a magnificent structure it is. Getting back to West Ham’s fortunes. They will be taking over a state paid for Olympic Stadium. They have contributed very little to the conversion costs which have been funded by us, the tax payer. The running costs will also only be part funded by the club with the balance paid for by the tax payer. Many of the London based football clubs are banding together to complain that this is unfair. West Ham have wealthy owners who should be dipping their hands in their own pockets. Unfair, I feel its a disgrace, Arsenal have had many years living in a kind of suspended animation, paying off our debts gradually, keeping our expenses down and being ridiculed by all , but we did it as it was the only way forward. We are now over the worse and our investments are now recovering, and now we see another Football club being given a helping hand. I hasten to add that had Arsenal buckled after the enormous expense, and failed to meet our debts we would have been deducted points and could have lost our position in the Premier league. How can these happenings be fair to all, what’s your views on this?